There are only a few opportunities to own a Dayton Portable Typewriter, and one lately came my way. The machine above is one of seven known to be circulating among collectors.1 It now sits in my collection, alongside a Molle No. 3 and a Fay-Sholes No. 6. That the Dayton, introduced in 1924, is a rare machine is part of its appeal, but still more appealing is its story. The idea was to capture the low end of the typewriter market, offering an inexpensive machine to consumers who otherwise could not afford one. In essence, it was to be a typewriter for the masses. Only, the company did not succeed, and if serial numbers are any indication, the company produced no more than a few hundred of these machines. The Dayton Portable Typewriter Co. of Dayton, Ohio, occupies an unenviable place in history as a failed enterprise. 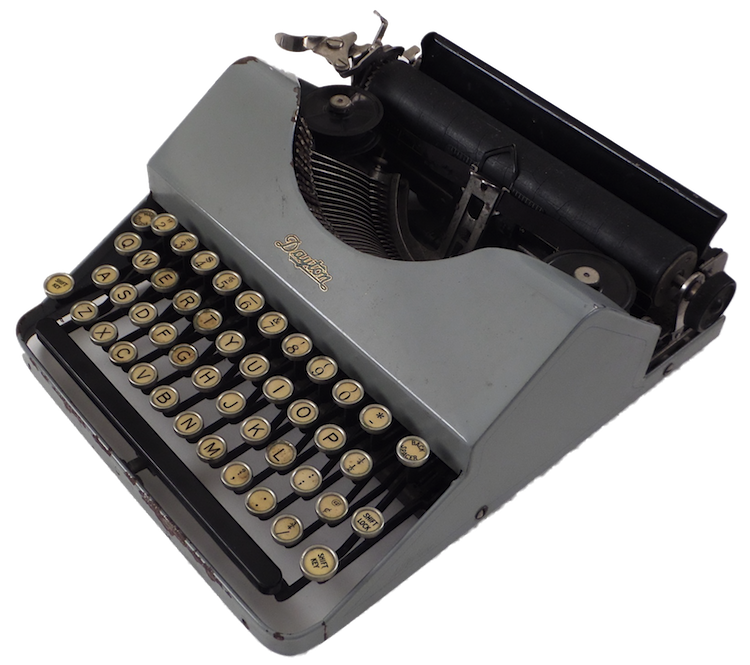 I first learned about the Dayton reading Darryl Rehr’s Antique Typewriters.2 I was captivated by the machine’s ultra-utilitarian design and stark appearance, feeling that, despite its aesthetic deficiencies, the machine was worth owning. Frankly, I never anticipated owning one. Now that I do, I am compelled to compile its history. For this task, I rely on two sources: Richard Polt’s write-up on the Dayton for ETCetera3 and Robert Messenger’s blog entry, “Day of the Dayton, Typewriter of the Damned”4 — in addition to my own research. Carpenter wrote at least two books, Profit Making in Shop and Factory Management and Increasing Production, Decreasing Costs, indicating he possessed the expertise to lead a company in the production of an inexpensive portable typewriter. Logo – Click to enlarge. The Dayton Portable Typewriter Co. was incorporated June, 1922, having an authorized capital of $500,000.6 How much stock was actually issued is uncertain. A July 9, 1922, New York Times announcement mentions a figure of $200,000 for a Delaware charter.7 Whatever the case, the company ultimately may not have raised enough funds to sustain this project. That so few typewriters were ever produced suggests this possibility. Technically this may be true, but it seems the company ignored one critical factor in the design of its machine: consumer psychology. Customers demand novelty and variety. The Dayton promised neither. (Granted, Apple essentially sells one phone, but it is a damned pretty phone, and full of innovation.) What Dayton offered was an inexpensive version of an existing invention. To succeed, their machine would have to be very cheap, and abundant. At $35 the machine was only relatively cheap, but not very abundant. Joseph Horne’s was a regional department store chain based in Pittsburgh, Pennsalvania.11 One wonders if Dayton employed salesmen — typewriters were often sold by traveling salesmen in those days — or if the company relied on retailers for the distribution of this budget machine. It is possible, given the Dayton’s limited volume, that only a few retailers ever carried this machine.12 In any event, Dayton ceased production of its typewriter some months after it was introduced — either late in 1924 (selling off its remaining stock in December) or else sometime in early 1925. Some authorities suggest the Dayton failed because its build quality was inferior to other competing machines. Collector Richard Polt, who owns one, questions this assumption and so do I; further, there is no primary source information confirming this view. A 1924 Dayton beside a 1923 Remington. Success at the low end of any market requires volume and capacity. You may have the cheapest product, but you also have the slimmest margin. While there is money to be made at the low end, volume must be high; otherwise, you’ll never make enough money to cover your start-up costs. As mentioned above, for lack of funds Dayton likely never reached critical mass in terms of volume. Given that Remington was manufacturing tens of thousands of portables each month (not to mention several other major companies), producing a mere few hundred would have had a negligible impact on the market. Further, Dayton could never have survived as a “boutique” typewriter company. The comparison between Dayton and Ford, also, is faulty. Ford may have succeeded through “intensified quantity production,” but the market for a mass produced car was a new market then. By the time the Dayton appeared on the scene, the typewriter market was already established and growing. Considering the secondary (used) typewriter market, at $35, was the Dayton really that much cheaper? “One model and one style” makes sense from the engineering standpoint, but the customer simply does not buy it. Consumers demand variety and innovation, and, given one choice, customers have but one decision, that, quickly made, might lead him or her to another product. Further, cheaper models within a product line often inspire customers to “step up,” even if only on the basis of perceived value. Customers like choice, and the choices Dayton offered were gray or black. Supposing Dayton succeeded, nothing would have prevented larger manufactures from undercutting them. Except that Dayton controlled a significant part of the low-end typewriter market, long-term survival would have been doubtful. Certainly, stockholders perceived this shortcoming. The Dayton was no Cadillac. I am fortunate in that my Dayton is in good working order, though a thorough cleaning and some adjustments are necessary. I concur with Polt that the Dayton is a solid machine. The metals, nearly a hundred years old, are not cracked or stressed. The frame is straight. And the plastics have endured. Even the carrying case is sturdy: the edges being reenforced with metal plates and the bottom portion of the case being made of metal. Overall, the build is not cheap. Curiously, the shift lock key on the Dayton is on the right-hand side, not the left. I cannot tell why, except that such placement makes the machine all the more distinctive. Overall, the Dayton is very solid and functional, though a little inelegant. It is a slightly larger machine than other portables, and a bit heavier — more still by the metal in the case. It is a decent typer. Note: More photos will be forthcoming. If you have any to share, please e-mail netadams @ gmail. The extendable platen knob is a bit of a mystery. I looked over the patent applications for this typewriter and found no mention of it. That’s a rare one alright. #7 known to collectors. I’m sure someday they’ll be worth something more than just an historical oddity, and it’s always good to tease out a little more history behind the blip in time that was The Dayton. Yes, a rare and interesting machine to collect. Based on Richard Polt’s article on the Dayton, those who own one are Thomas Fürtig, Polt, the Milwaukee Public Museum (two machines), and the Rehr collection, plus Bill’s and mine. That’s seven. Given that the 1924 advertisement for the Dayton is from Pittsburgh, I suspect there might be more in that area. Perhaps more will be found. Very much a shame the Dayton didn’t survive, but it is (after more reflection) a very basic machine. I agree. Yours seems to be in quite good shape after you knocked the cobwebs out. I’m hoping Bill will get around to fixing his up soon, but his backlog of customer machines to fix & clean is daunting lately. I can’t remember if one of the other surviving machines has the black paint job like Bill’s. It seems like all the ones I’ve seen pictures of have variations of the smooth bluish-green paint either with or without the pinstriping. It’s too bad his example has much of the paint missing. It seems like it could be made functional again, as it’s complete parts-wise and isn’t terribly rusted. Excellent research, great article. Congratulations on your machine. It’s working better than mine. I am not sure about the consumer demand for variety. The Remington portable #1 was a available only in black, so the Dayton actually offered a little more variety. Duco paints, offereing a variety of high-gloss colors for industrial products, were introduced only in 1923 (http://www2.dupont.com/Phoenix_Heritage/en_US/1923_b_detail.html) and I suppose they weren’t in wide use yet when the Dayton went into production. Thanks for sharing your research on the little known Dayton, very well put together. I also appreciated the video. Your machine looks like its in decent shape. I’m curious, does it have a tight/heavy typing feel? 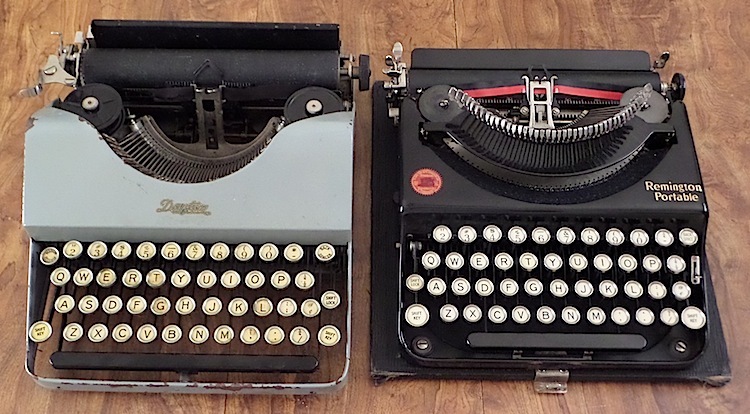 I wouldn’t call it a heavy typer, but it is not exactly a light typer — perhaps on par with some of the early Remington portables. Mine is in fairly good shape, but it does need a bit of servicing. The platen is hard and cracked, which affects the typing experience some: namely, the typeface sometimes cuts through the paper, especially the period and dash. That said, if I were in the market for a budget typer in 1924, I give this machine serious consideration. I will post a typing sample soon. Added the following: new links, typing samples, and another video of the Dayton, focusing on the platen knob, which is extendable. Thanks for visiting this page. Thanks a lot for the new video. The knob will not extend on my Dayton, but that may just be because it’s frozen up and would be loose if properly lubed or unjammed. There’s a lever on the left that will also apparently do the same thing — rotate the platen to wherever you want. However, there is often a difference between 2 functions on a typewriter: one function temporarily disengages the platen, but will return it to the original setting when re-engaged; the other function disengages the platen and then sets it at a new position. The mechanical difference is whether the toothed wheel on the left end of the platen is rotating or not when you freely rotate the platen. It does not seem to have that effect. (I recently reviewed the TP1 which has this feature.) On the Dayton, the platen is not disengaged or otherwise affected. Paper advancement is still by set increments. I also considered that perhaps this function allows the platen to be removed, but that is not the case either. A real puzzle as to what purpose it serves. All that is evident is that the knob was designed to extend.